. 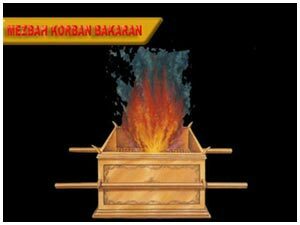 :: Tabernacle Pentecostal Church Kristus Kasih - Malang - Information tabernacle equipment: the altar of burnt offerings ::. There are 4 horns overlaid with brass on its four corners. In the midst of the altar was a grate of brazen network with 4 brazen rings at its four corners. It was set under the ledge of the altar so that it extended hallway down the altar. 2 staves/poles of shittim/acasia wood overlaid with brass were inserted into the rings so that they would be on the two sides of the altar when it was carried. The pans, the shovels, the basins, the flesh hooks/forks, and the fire pans were all made of brass. The spiritual connotation of the Altar of Burnt Offerings is the CROSS-where Jesus sacrificed Himself. The Altar of Burnt Offerings also refers to the BLOOD BAPTISM (original text of Revelation 1:5b), which eradicates sin. BLOOD BAPTISM refers to CONVERSION. The Altar was made of shittim/acasia wood overlaid with brass. BRASS denotes God’s judgment (vengeance). The hard, blackish shittim/acasia wood refers to man’s sinfulness, which deserves God’s Judgment. God hates sin, but He loves the sinner, for He is a Just/Righteous God.